Sadly the workaround is a cache clear until they fix it, or to disable caching in Firefox, which I can confirm does work. I realise I’ve not posted for a while, and I’ll try and atone for that going forward, I’ve been a busy server guy at work, but onto the good stuff. I know Hyper-V, I’m not new to the existence of Hyper-V, but I’ve only ever briefly touched it in lab environments, until recently. I had cause to do a number of small site deployments in the US on Hyper-V, my first choice being for a proper VMware setup with vCenter and a shared storage platform, but for one reason or another, my hand was forced and I had to go in guns blazing with Hyper-V, no shared storage and no Microsoft System Centre Virtual Machine Manager (SCVMM) either. For those that haven’t looked at Server Core installs yet, firstly, why not? Secondly, please do, it’s a great feature of Windows Server for enterprise and business setups and something that Windows Server nerds everywhere should be doing more of. I’m happy with PowerShell, so deployment wasn’t hard, that’s not to say I’m 100% au-fait with every set of cmdlets on offer and know the whole she-bang inside out, but it’s pretty easy to get going. Once the install was done and networking configured (loving the native NIC teaming since Server 2012), Hyper-V role installed and servers fully patched it was time to start actually configuring the thing. Again, Microsoft have made the whole thing fairly straightforward via the Hyper-V console and since I’m not a PowerShell martyr, I use it where things are easier but use the GUI where it makes sense for some things, I was happy to proceed in the GUI for some of the config. So, onto what I liked, the live migration with shared nothing is great, although something I know ESXi also has. The replication of a VM between hosts, and the ability for one of those replicas to effectively be powered on in an unplanned failover scenario is great and failed back when things are working as planned again. Ok, I know it’s not a full HA setup in the sense that it requires intervention for it to work, but it’s a step up from what you get with just ESXi without vCenter. Hot-add of memory is now available in Hyper-V since the Server 2016 version, as well as hot-add of network adapters, which brings it a lot of the way towards VMware’s offering in terms of hot-add features. PowerShell Direct is amazing, the ability to have a console-esq PowerShell session to a guest OS from the host regardless of networking or firewall is great. Obviously there are some things missing from Hyper-V still, vCPU hot-add being one, but not one that I personally use too often. The HTML5 interface of the later iterations of VMware’s product are also great, no need for an installed application to manage the thing is always good news. Hyper-V can easily suffice for small scale deployments and is well worth a look these days. In it’s current evolution it’s a big leap from where it was in it’s Server 2008 days. As time goes by, there really is getting less and less between Hyper-V and ESXi, and that can only be good. No one benefits from a monopoly position, with the exception of the monopoly holder, so it’s good to have some healthy competition in the market and I look forward to seeing what Microsoft can do with the platform in the future. I’ve seen a really strange error with Windows updates on some 2008 R2 servers where they fail to start downloading and installing updates. They can connect to Windows Update and find available updates, but once you select them and start the process off they fail after a few minutes. I’d tried all sorts, including rebooting and all the usual stuff. This then allowed me to start the updates downloading and installing. I think it’s something to do with Windows update not being able to create the taskbar icon in the notification area and the subsequent balloon notification that says updates are downloading, but that’s just a wild theory of mine, I have no proof that’s what it is. I know the whole solution sounds a bit mental, but I’ve done this on a fair number of servers that were playing up with regards to downloading updates now and it’s always worked. I recently came across a problem within a DFSR replicated folder where some files were not being replicated between the folders. After a bit of checking to make sure the file types were not on the excluded list I concluded that these could be temporary file after seeing this mentioned on a couple of forum threads. PS L:\> fsutil usn readdata "Camera log.xlsx"
The output here includes the file attributes on the file. The file attributes field is a bitmask that shows exactly what combinations of attributes have been set on the file in question. In my case shown here, 0x120 would be 0x20 (Archive) and 0x100 (Temporary) giving a bitmask of 0x120 for the file attributes. Microsoft have an “Ask the Directory Services Team” blog post about this, listing all the possible values you can have in the file attributes field, but the short answer is 0x100 is the temporary value and if you’re bitmask includes the temporary attribute, then the file wouldn’t be replicated by DFSR. Or if you just want to do this in the current folder, just remove the recurse switch. Creating a new user account and just using that, not an option if the problem affects all accounts on the machine. The only one of the options mentioned that did help was to re-install Windows, this left the start menu working. However as soon as I domain joined the machine again, it stopped working again after a restart. This led me to look at Group Policy as a potential culprit, and sure enough, moving the object to a separate OU and blocking all policy on it left the start menu working. After a long process of linking policies in one by one I came down to a very specific registry setting. I’d set the ACLs on a specific registry subkey of HKLM, in this case it was HKLM\Software\Microsoft\RPC. These ACLs were missing one specific entry, namely APPLICATION PACKAGE AUTHORITY\ALL APPLICATION PACKAGES. Adding this in with only read permissions and forcing a policy update brought the start menu immediately back to life. That ACL is one that has appeared in Server 2012 I think, but since that particular part of our policy predates 2012 that ACL wasn’t there. Oddly enough I’ve not seen this cause any problems with Server 2012/2012 R2/Windows 8/8.1, only with Server 2016 & Windows 10. So the take away from this is to make sure if you restrict any registry ACLs, make sure you include read access for APPLICATION PACKAGE AUTHORITY\ALL APPLICATION PACKAGES. If all this was helpful and worked for you, please drop a quick note in the comments. I did a little Googling of the problem and found a number of posts reporting this was related to IPv6 and that the fix or workaround was to disable IPv6. In my eyes this isn’t a workaround, Microsoft do advise against disabling IPv6. So, after a little more thinking about this, I wondered how the WinRM listeners were configured, and in particular the IPv6 listeners. Surprise, surprise, the IPv4 listeners were configured, but the IPv6 listeners simply were empty in Group Policy. An empty listener address range in policy means those listeners are disabled. 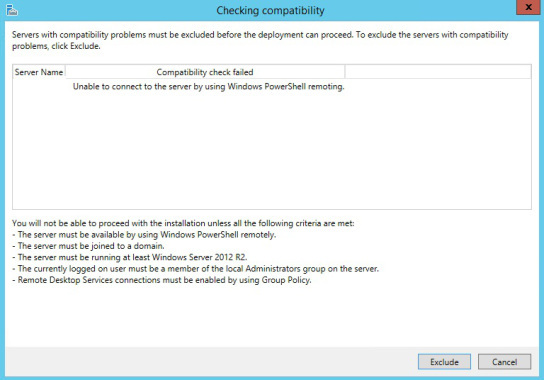 Configuring these correctly in the policy and restarting the server then allowed the RDS installation to proceed. Microsoft do give some detail on how to configure this setting and I just thought I’d share, as disabling IPv6 shouldn’t really be a fix for anything.